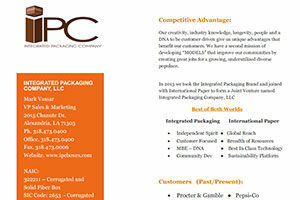 IPC is a 23 yr. old award-winning corrugated box manufacturer and a supplier of creative packaging solutions to Multi-National Companies. We offer customers a full range of packaging and display options, from Design and Concept Development to Market Ready graphic packaging to World-Wide Logistics and Fulfillment. We focus on containing everything our customer value with regards to our products, our services, culture. and save this document for your records.